I’ve talked about the “Photographers Panic” recently. This shot is probably the most extreme version of the panic I’ve ever experienced! 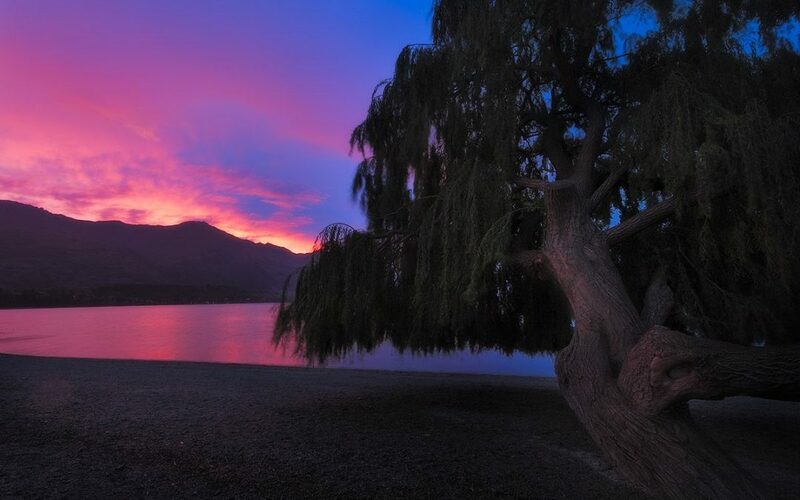 I took it in a town in NZ called Wanaka, a place which is quite famous for a particular tree (which I didn’t take any photos of, the contrarian that I am lol). The afternoon leading up to this sunset was a complete grey-out, with off-and-on rain and thick, thick clouds, so we took the opportunity to get out and explore the surrounding area without any pressure of taking photos. Then as sunset drew close we went back to a spot we’d scouted earlier, we sat and waited. It was a long-shot but the clouds didn’t part and visibility dropped with the low cloud and now heavy rain. So we called it a day and headed back to town – about a 10-15 minute drive. “Oh well, it’s already 15 past sunset, we’ve probably missed the best of it already”. And the panic started to set in! As we pulled into town, the glow was just about at its peak. So I pulled up in the first car park at the near side of the lake, we grabbed our gear and ran down to the shore. It was still raining, but even though I had to wipe my lens in between each exposure (without moving it), that wasn’t the biggest challenge. The biggest challenge was finding a half-decent composition in the 2-3 minute window of light that we had. Even with the short window, I still took a minute to walk around and pick out a good view (as opposed to what I’d have done in the old days which is just point the camera towards the sky and click!). I really wanted to be closer to the lake and make the reflections a bigger part of the shot, but in doing that I realised that the foreground would have just been a big blob of colour with nothing to anchor our view. So I stepped back up the beach and put this tree in the foreground. I say foreground, it’s more like a shot of two halves now – left and right. But in a way, I think it gives the shot balance to have a big strong object one side and a strong colourful sunset on the other. Neither one really pulls your eye away from the other for too long, because the other pulls you right back. By the time I took the two exposures that make up this shot, it was probably half an hour past sunset. And the “good stuff” didn’t even start until way past the official sunset time. So it bears repeating that you should never write off a sunrise or sunset photoshoot too soon! The other reason I picked this shot to talk about is to build on what I mentioned in a recent email about balance in composition. I don’t know if this shot conforms to any particular rules (like the rule of thirds etc), but what I like about it is how it’s virtually split in two down the middle with near stuff on the right and far stuff on the left, rather than near being in the bottom of the frame and distant being in the top. I find that this works because both elements are strong. If this same tree was against a background of no mountains and no strong sunset, I don’t think it would have had the same balance, because the tree would be the strongest element and make the other half of the frame irrelevant. The first shot was exposed for the sky and due to its relative brightness, the tree was almost a complete silhouette. So the second exposure was brighter to capture some of that nice detail in the tree. I also liked how some of that pink has bled into the tree trunk thanks to the fact the whole sky off to my left (out of frame) was also alight with this amazing glow. That would have been lost in a silhouetted tree, so it was definitely worth the effort to take both and blend them in Photoshop. 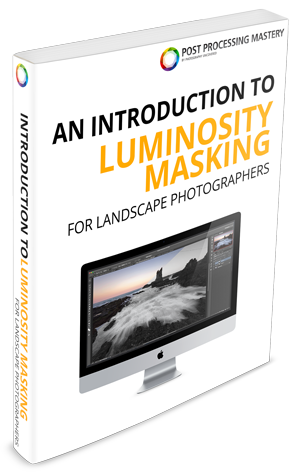 If you want to see how I do that kind of thing in PS, it’s all in my Luminosity Masking Mastery course here.